I have recently had a small number of comments, mostly `anonymous' that I've taken exception to. One in particular has posted two in which he made sneering and snide comments about my attempts at Indian Portraits (and the fact I misspelled Amy Winehouse) - the last saying I should give up Indian portraits. Well he's entitled to his opinion, it's the way he (I presume it's a he) expressed his views that I objected to, under this `anonymous' title. Anything that is `anonymous' is deleted as a matter of policy by the way. I paint as a hobby and the actual painting he objected to isn't a million miles away from the one I used as a guide. I'm not suggesting it is good or even 100% accurate as I have no illusions about my ability as an artist. All these posts emanated from Americans it would appear - not all on the same topic. I'm not anti American having been there many times. It's a wonderful country and the majority I've met have been really nice people, in fact some from Florida we met on a tour invited us to come and stay with them. During the time I've been doing this blog I've had very little unpleasantness. 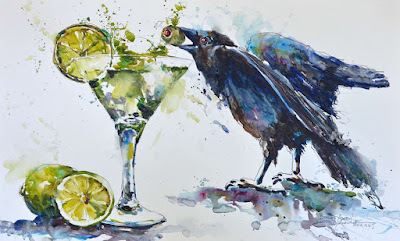 The blog is just a hobby not life and death - there are far more important things happening as anyone keeping abreast of the news - not least in America - knows. .On one occasion a less than fulsome review of the then new magazine `The Art of Watercolour' brought an anonymous comment that I was a moron. On another occasion a young lady got hot under the colour about the difference between amateurs and professional but later apologized after I pointed out it was the way she expressed herself not her actual opinions. To clarify. To those who need reminding don't bother posting such stuff because it will just be deleted, especially, but not only, if it is anonymous, nor will I respond to it. This sort of confrontational attitude isn't acceptable on a blog of this nature and I won't allow it. This the last installment of my take on artists easels consists of three of my favourites.The Herring Versatile Easel is a relatively expensive item (currently £109) for those living in the UK but the shipping costs to Australia double the price (the same applies for UK artists with regard to SunEden products from The USA which aren't cheap to start with PGW). This easel has been in continual production for 55 years and is possibly the sturdiest easel I own. I did send e-mails to Potter in Norwich as I liked the wide support (see my view on the Potter PGW) but received no answer so I went for the Herring. Just as well I suppose as the heavier Potter would have cost more in shipping costs. The Herring weighs in at 1.5kg. I am unable to use the Easel Butler but can utilize the Best Brella. 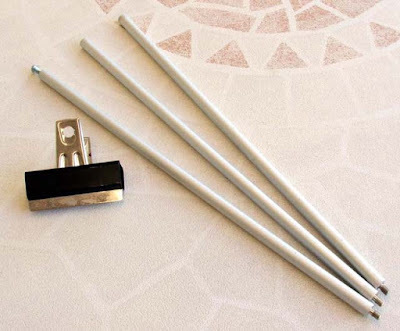 There are a couple of accessories for this easel. 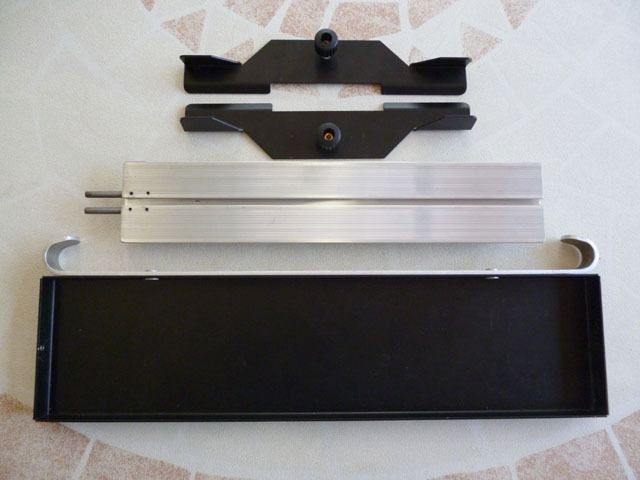 A metal shelf, 12" and 18" extension for the aluminium support and metal picture slides. Picture slides,12" extension and shelf. Due to the shelf being somewhat narrow I am forced to use my Craig Young Paint Box as my usual palette, the CY palette box is far too large. As you can see the Paint Box fits perfectly. The artist Robert Brindley, who uses both a Herring and a CY Palette Box, has bolted a larger shelf onto the small Herring shelf, which holds his palette and mixing palettes, something I intend to do. See it on his Town House DVD. I have had more trouble with wooden field easels than any other type. Due to my insistence that the ensemble be solid and not move when erected. I have sold or given away three Mabef wooden field easels. The problem was with the screw at the apex, which when tightened with normal pressure did not hold the legs and support tightly.More force was needed and the obvious happened - I stripped the thread. 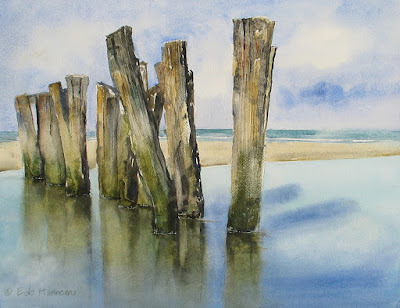 Both Trevor Chamberlain and David Curtis use a W & N "Perfect" easel, having done so for the past forty years, so I considered that an excellent reference. The trouble is the last advertisement I saw was in an artists magazine from the late 1960s and I believe production ceased in the 1970s. However everything comes for those who wait and sure enough one appeared on eBay in Dublin. 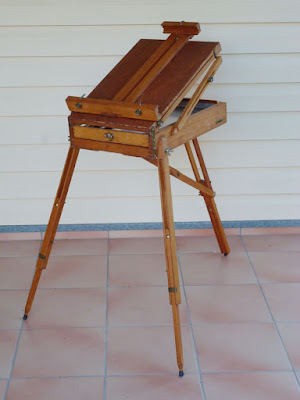 Not only a Perfect easel but one in the original box with papers. I was the only bidder so was I wrong in thinking this the best wooden field easel? My view is that this is the bees knees of easels. 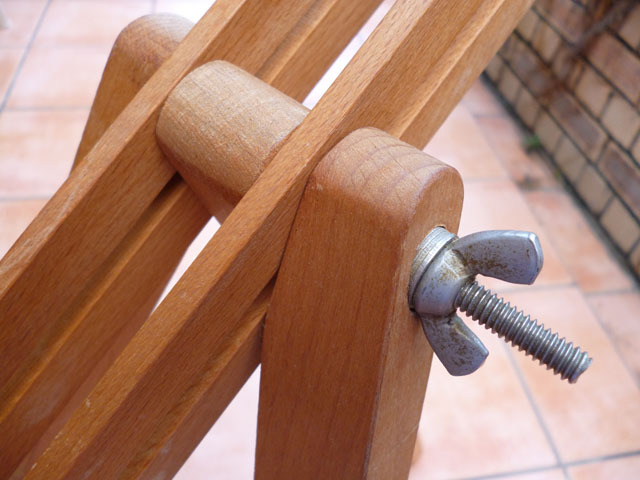 The apex screw holds the legs and support bar firmly, unnecessary force not being required. 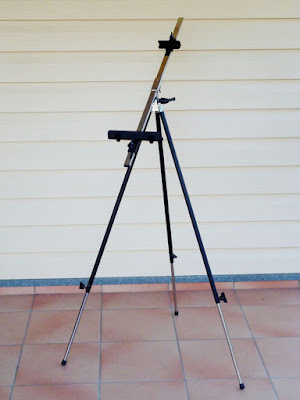 Currently I am using this one more than any other, even though I consider my original Manfrotto photographic tripod the most versatile due to the ball head. 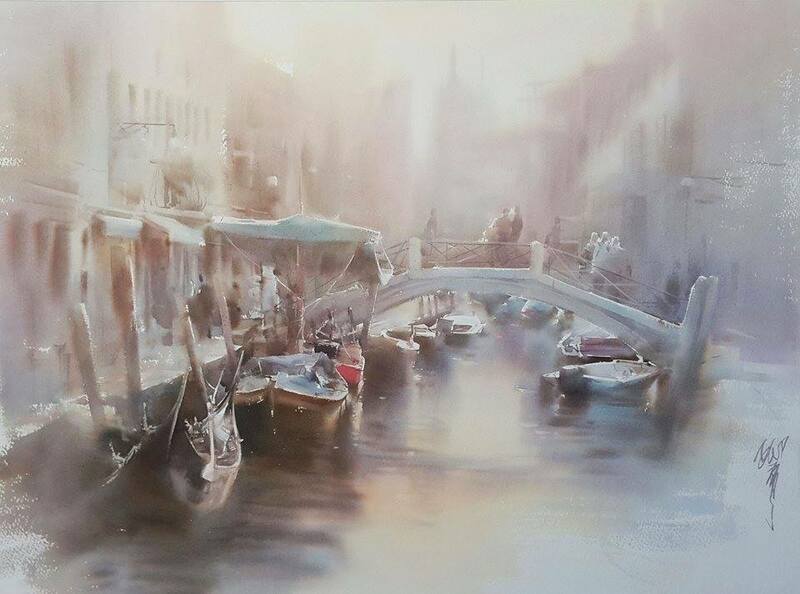 I have no link for this easel, but refer you to the writings of Trevor Chamberlain and David Curtis. 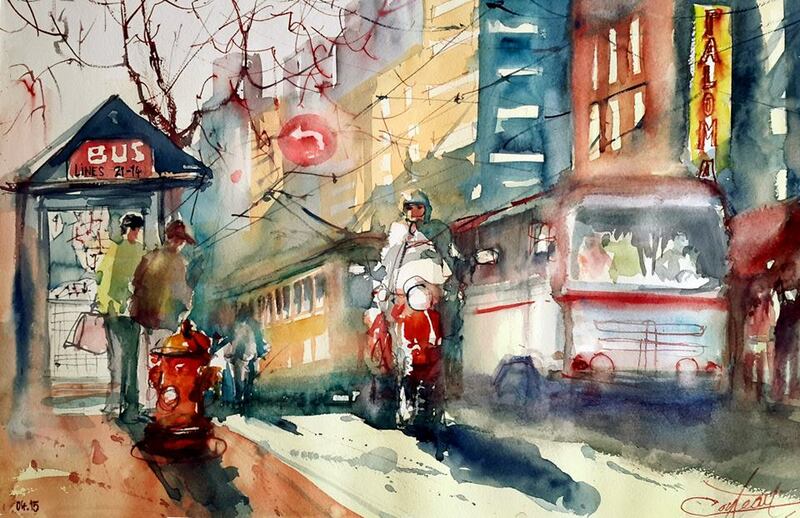 This easel is from Malcolm Carver, a high profile Australian watercolourist. An acrylic A3 board with weighted foot and ball head makes this the best table top easel I have found. It is also the most expensive. I have other table easels but the Carver with the ball head is by far the most versatile. 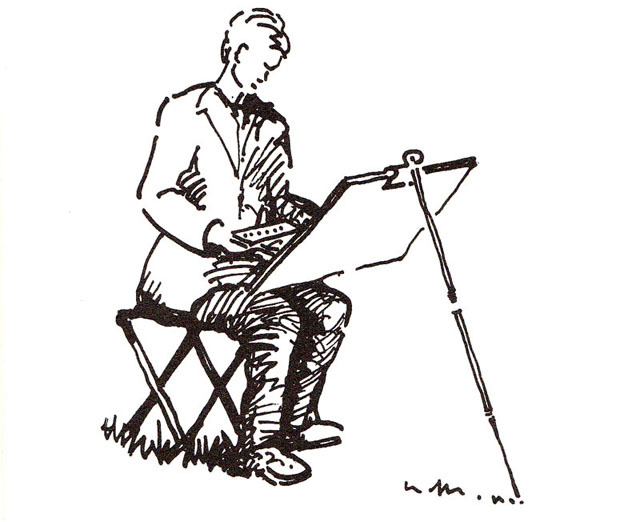 To conclude; there was another high-profile English artist who used a `Perfect' easel and that was Edward Wesson. 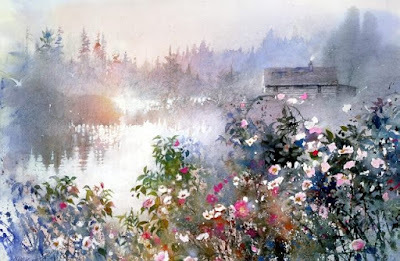 Between 1961 and 1981 Ted Wesson wrote 18 articles for `The Artist' and 15 for `Leisure Painter'. 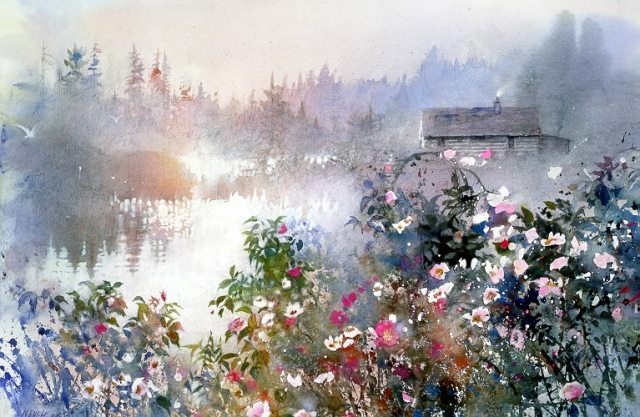 Ted died in 1983 before the advent of art videos and DVD's so his autobiography "My Corner of The Field", the five books written about him, the 33 articles penned by him, a couple of 16mm short films and the thousands of paintings he produced are the only insights into the man and his art. All six books mention his palette and the use of a French Polishers Mop. However in his magazine articles he delves deeper into methods, techniques and philosophy with eight quotes on easels. Our easel should be light in weight and easy to carry. It can be one of the orthodox patterns or the camera tripod type with a swivel top and the appropriate screw fitting, which attaches to the board. There are a good variety of both types available. ((The Artist - January 1964). 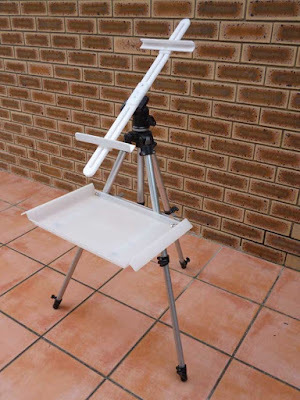 Now whether we stand or sit .... one of the most essentials items in our equipment will be an easel and here we need to exercise care in our choice. 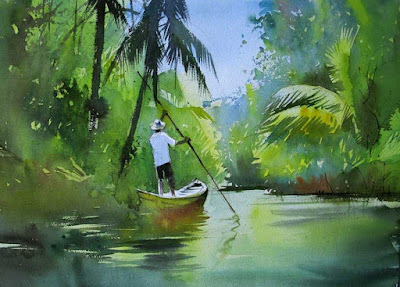 One called `"The Perfect"* is most reliable, not too heavy but fairly firm and safe. There is one lighter weight which has so many wing nuts to negotiate that, if not careful collapses as soon as we look at it. There are other more elaborate ones that look more like dentists chairs but I doubt whether they are any more efficient. As with so many other pieces of equipment in these modern times, the simpler they are the more effective they will be. 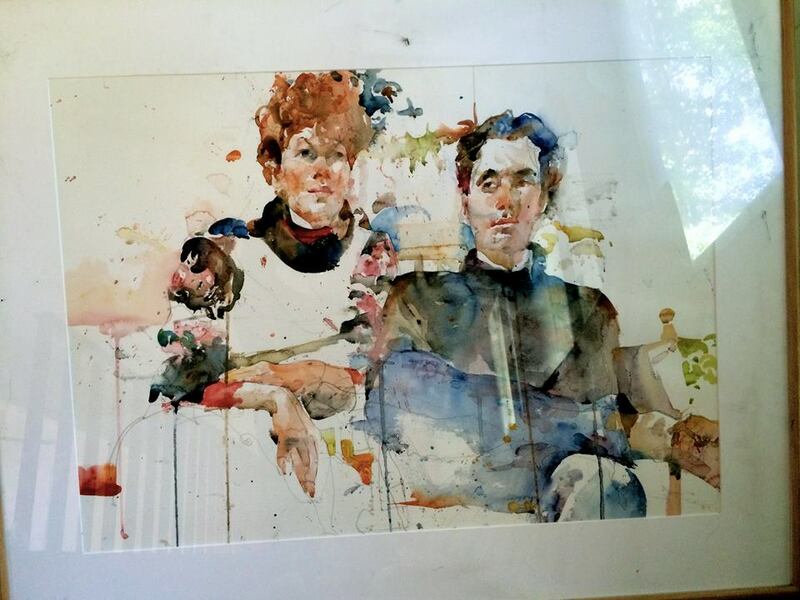 It would seem that Ted got his "Perfect" sometime after 1967 but still used a box easel for oil painting. 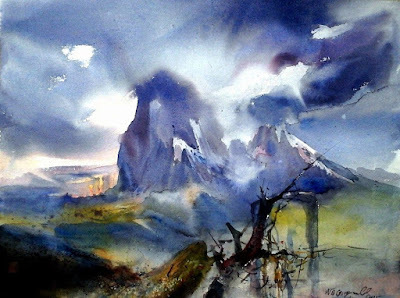 As fas as palettes go he started off with a Roberson De Wint, switched to a Winsor & Newton Binning Munro and ended up with a Holbein 1000. My experience with easels (writes Peter Ward) is a fraction of Johns. I started off with a heavy metal easel of no obvious make which was later discarded. I have a Jakar metal easel, painted black, purchased from Great Art. This is not too heavy and easily dismantled to go in a carry case. I also have two `makeshift. 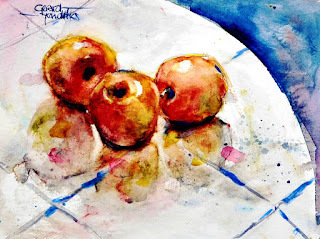 ones, the first purchased from an artist who made them, after seeing them at EPC in Catalonia. I lugged mine to Spain only to find I could have used one of those. 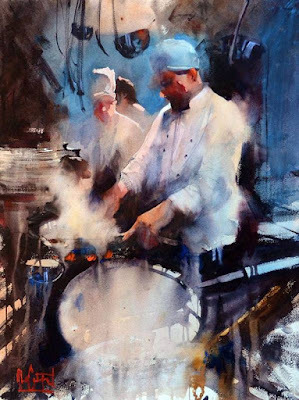 I've seen this called the `Alvaro Castagnet' easel . It is homemade with a cheap photographic tripod and two other parts, including a wooden shelf that fits on the tripod legs. Being homemade it cost quite a lot and is described fully with illustrations in an early post on here that you will find in the Index July 2014: regularly updated. I haven't used it for a while as I don't paint plein air these days. Would I buy one with hindsight? Probably not. My preferred option is the one described by John using a Ken Bromley bracket. In my case I bought a better quality tripod - about £30 - which has to have a screw top. There are plenty available and also adaptors with screw tops. I have two boards one large, one smaller each with a Bromley bracket screwed on. I used 6mm MDF but had to glue small pieces on to this, equating to the size of the bracket, which came from a piece of backing out of a photo frame. 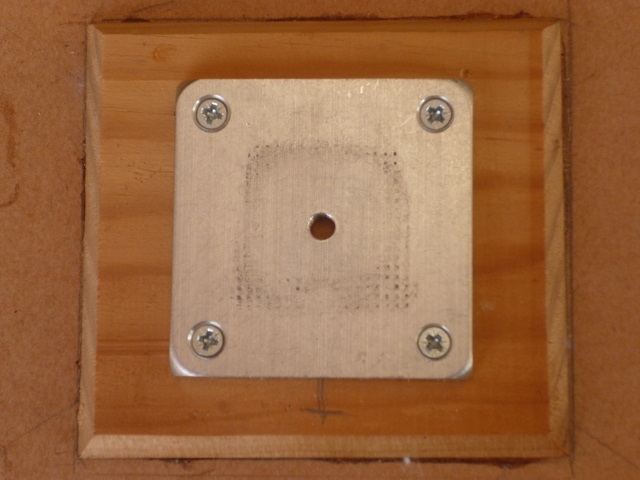 The reason was that the screws slightly protruded with the basic 6mm board, all detailed in an earlier post so if you are interested look it up in the index. The main problem is lack of a shelf so if you are competent at `Do-it Yourself - I'm not - you can make one or get a carpenter to knock one up. When I became aware of SunEden products I saw the perfect shelf arrangement but with the cost of carriage from the USA equal to the cost of the product - the whole lot at least £80. My frugal upbringing in the North of England prevents me going to extremes, although I have strayed over the line on many occasions, primarily with palettes. I'm not sure that paying a fortune for a shelf is in the same league. We now come to something I have experienced which John hasn't - The David Potter Easel. At the time this was introduced it got rave reviews but then when have you ever seen a bad one in art magazines, especially when an advert for the product is prominent on the next page. I bought the lot which included two wooden shelves, very heavy, wheels and something else I can't remember. The easel is metal and the whole lot came to over £100. The idea is you can assemble the thing, and trundle it around when the wheels are connected. I did use it a few times but eventully looked for something less complicated and lighter. Overengineered? I think so. The one I had was an early one and it proved difficult to tilt. They did introduce some sort of modification later. 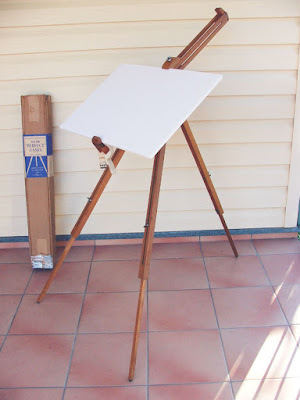 I know some prominent artists have used this easel and when on a Judi Whitton workshop in Cornwall, she had one in the studio that she demonstrated with. I didn't see her lugging it around however. In the end I discarded it and sold or gave away a couple of bits. I still have the small shelf which I can use with my tripod setup but it isn't ideal, being quite heavy. That's it then folks. Many thanks to John for this very comprehensive and mind provoking article. If you have any questions he'll be pleased to answer them. I have managed to complete a couple of paintings, mainly at AVA `unofficial' sessions recently, although I did the drawing of `Many Goats' in my home `studio'. They are both portraits, although quite different. This is an impression of the late Amy Winehouse, a very troubled, if highly talented singer/songwriter. I saw what I presumed to be a very impressionistic photo/illustration in the Weekend part of the Observer newspaper. I was very taken by the colours and also the way the eyes and lips absolutely stood out. 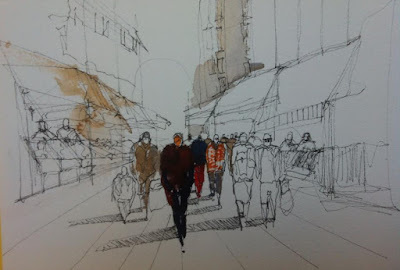 It's a new way of doing things for me, although based on my Charles Reid mantra of small areas of detail, large areas of generality. I concentrated on getting the lips and eyes as accurately as I'm capable of. To me they were the key, the rest just window dressing. 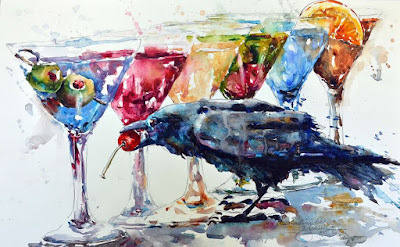 Colours used were Sap Green (Graham)and Apatite Green ( DS), various reds, Gold Ochre (W & N), Ultramarine Violet with darks, mainly Ultramarine Blue with either Burnt Umber or Transparent Brown (Schminke), some Cerulean heavily diluted, in fact all the facial colours were heavily diluted. I'm quite pleased with it faults and all. The top illustration was done a week ago and the final version yesterday. I think I prefer the partially finished painting! For some reason the finished painting has come out lighter.although taken with the same camera. 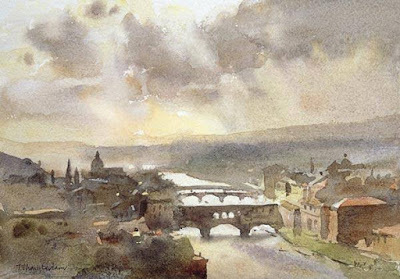 Never fear, next up will be the final part of John's excellent take on watercolour easels including a summary and much about Edward Wesson. It will take me a little time to type it all up. 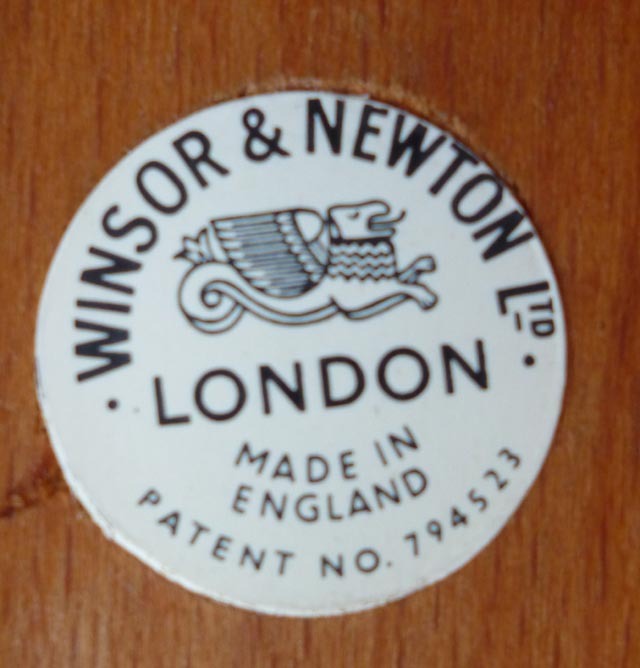 This easel; is manufactured in America and although mine is somewhat old they are still current. I first became aware of it when watching a Hazel Soan DVD and liked the way the support was held by spring loaded clips. The adjustment is similar to the mechanism of a photographic tripod with a pan head and, unlike a ball-headed tripod, the support bar only moves on the Y axis, whereas a ball head moves on the Y and X axis, which is the case in all the remaining easels depicted - with one exception.! There have been several versions of this tripod over the years, this is one of the earliest. 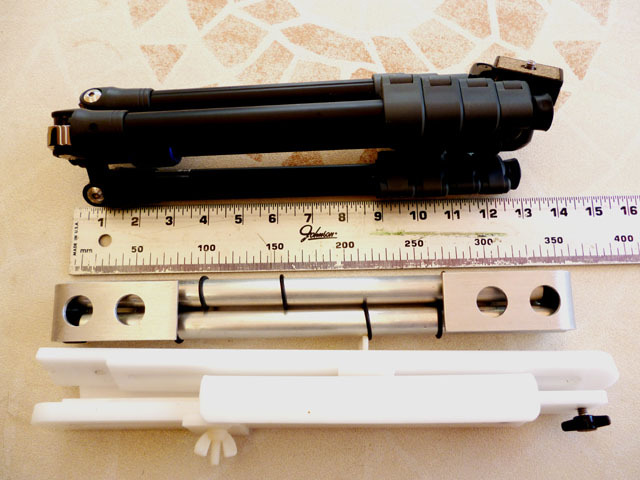 Hazel Soan has one with a lockable quadrant, to move the angle of the support bar (see pic). It is of average weight (2kg) but very stable and can take my Best Brella and Easel Butler. The Frome comes in different colours and some models have a couple of clips at the bottom horizontal support bar from which to hang a water container. 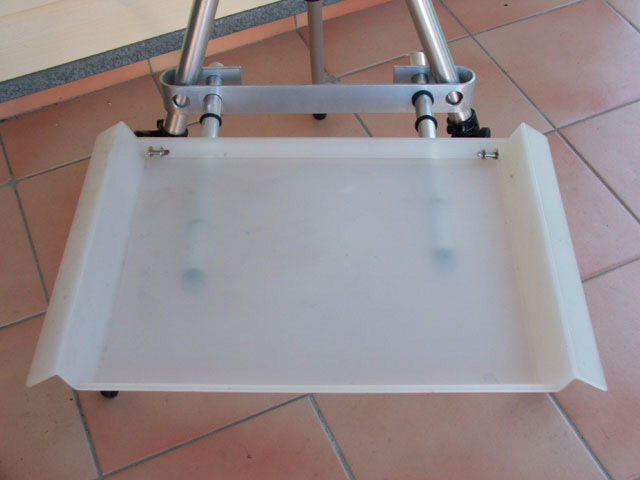 This Italian-made steel easel is quite heavy at 2.2kg but a model that is popular, possibly due to the fact despite the weight it is portable, although not to be carried for any length of time. 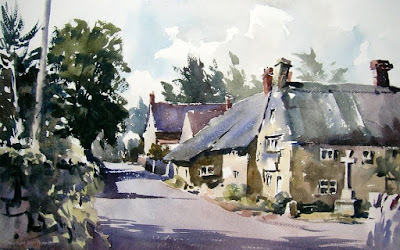 Australian artists visiting the UK for the purpose of filming demos for APV or Townhouse Films invariably end up with a Frome, but they are not available in Australia. 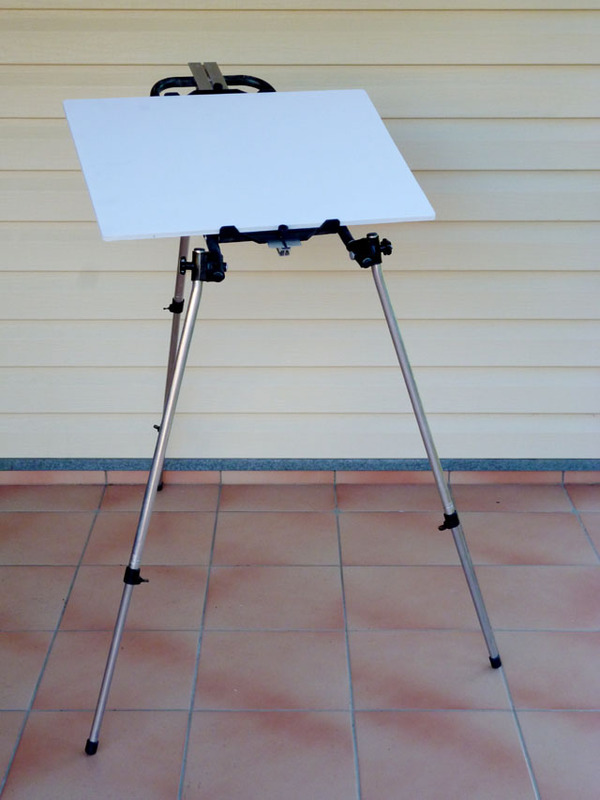 It is a positive sturdy easel with an oblong section support bar, with little or no play when locked, and my only criticism is the angle of the legs are set, and this can be a problem in windy conditions. This one is similar to the Frome but is lighter (1.1kg) as it is made from aluminium. The main support bar is of oval section and as such not as positive as the Frome, really needing a pair of pliers to tighten the brass screws, even then the support is not entirely wobble free. 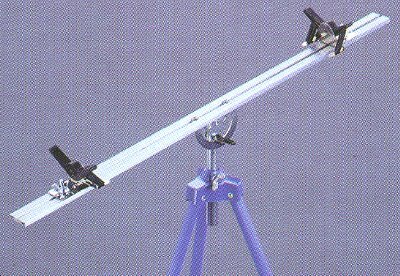 The legs are basically the same as the Frome with no adjustment: they are either open or closed but it is light and very transportable. I have to admit I use this easel least of all those I have collected over the years, mainly as there is movement of an attached support as it is virtually impossible to tighten the three round brass screws seen on the right of each movable piece. My search for the perfect easel hasn't been a search as such - I just see an easel in use by a particular artist and think "That looks an interesting easel", find a supplier, be it new from an art supplier or second hand on Ebay, and either keep it if liked or disposed of otherwise. Yes - I am fully aware I have too many easels but bear with me there are only three more to go! 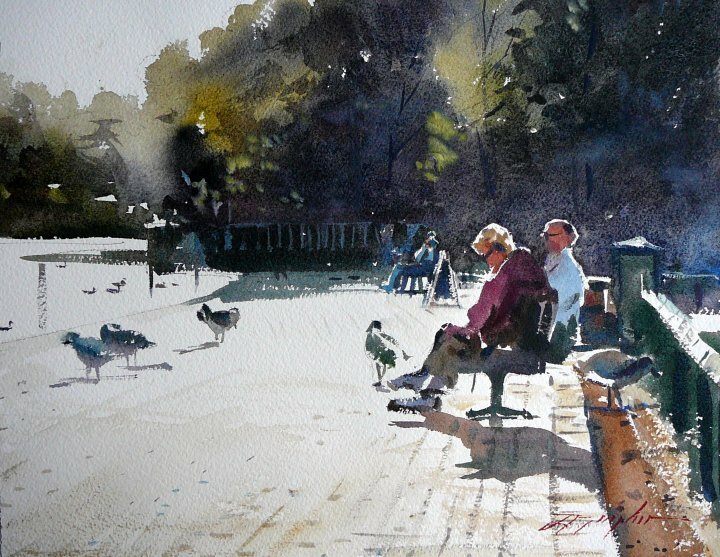 These are my latest efforts painted at the AVA `unofficial' session last Thursday. One is of the actor Emily Blunt and the other unfinished one of an old Navaho man called `Many Goats', from a photograph dated 1913. `Emily Blunt' 16" x 12 " Arches hot pressed. I was given a nearly full block by Jan Weeks some time ago, as she doesn't like the hot press surface. I have tried it a few times and it is okay (with reservations) for portraits, although I think I prefer a not surface. I concentrated on the eyes and the rest is just `generality'. Unfinished painting of `Many Goats' an old Navaho man, the guide photo emanating from 1913. I intend to finish it The face is full of deep lines and `craginess' which I've tried to capture. I've done this without bothering too much about the skin colour, although in the original black and white photograph it looks moderately light. In both instances colours used were confined to various combinations of Cadmium Red Light, Ultramarine or Cerulean Blue and Raw Sienna. The Cadmium and Raw Sienna are Rowney. Only a few brushes used, Isabey Travel brush No 6, Rosemary Travel brush No 6 - the Isabey although called a 6 is smaller and very slim compared to the Rosemary which is a more normal size 6, and the other is an Escoda travel brush No 8 or 10. All Kolinsky sables. Once again I have enlisted the aid of my good friend John Softly whose research and experimentation of the subject is second to none so here we go. EASELS (PT. ONE) BY JOHN SOFTLY. 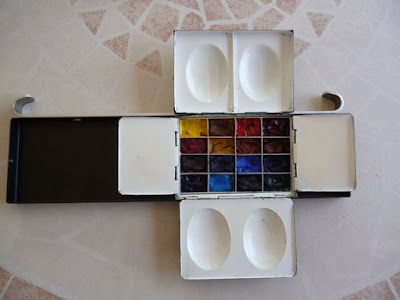 This review of watercolour easels is by no means extensive as models are restricted to those I own and have purchased over the last twenty years. I am somewhat pedantic as I like a painting surface to be sturdy, and my easels need to have little or no movement when erected. 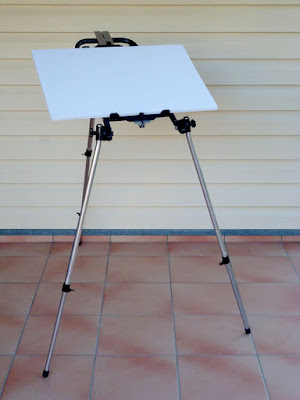 This has led to some expensive mistakes which were either sold or given away but the search for, what I consider to be the best easel, is at an end and the irony is the most versatile easel is possibly my first, made from a photographic tripod. Whether wood or metal is a matter of choice, and the balancing act between strength, stability, versatility and weight is paramount. 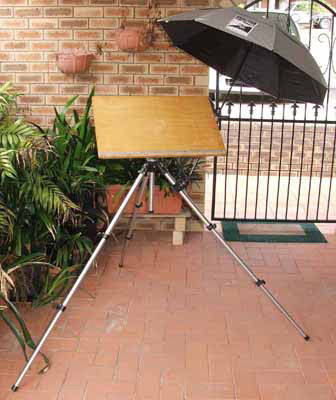 All the easels pictured are strong and stable, but the versatility and weight varies between models. This was my initial easel prior to equipping my studio (tin shed) with a drafting table. Many artists use box easels and the Mabef is one of the best. Heavy (5.5kg) and a pain to erect and dismantle it is stable and once in situ solid and versatile. 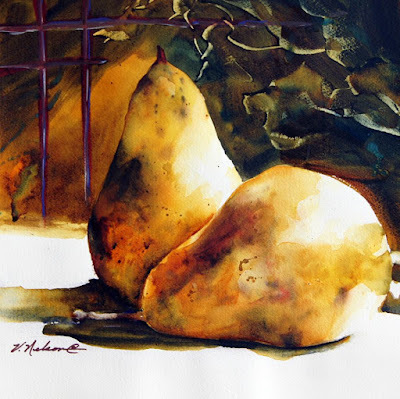 There are after market shelves from American art suppliers but are difficult to set up. I rarely use the tripod these days but keep it oiled. Linseed oil is the preparation for all beech easels and applied annually to keep in good condition. 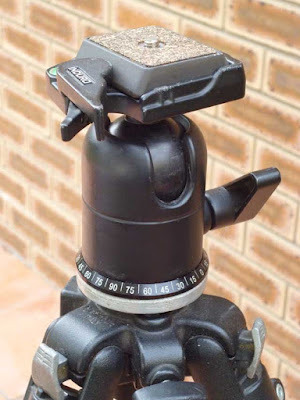 Tripod Ball Head - the lever on the right frees the ball and the small lever on the left releases the Quick Release Plate. 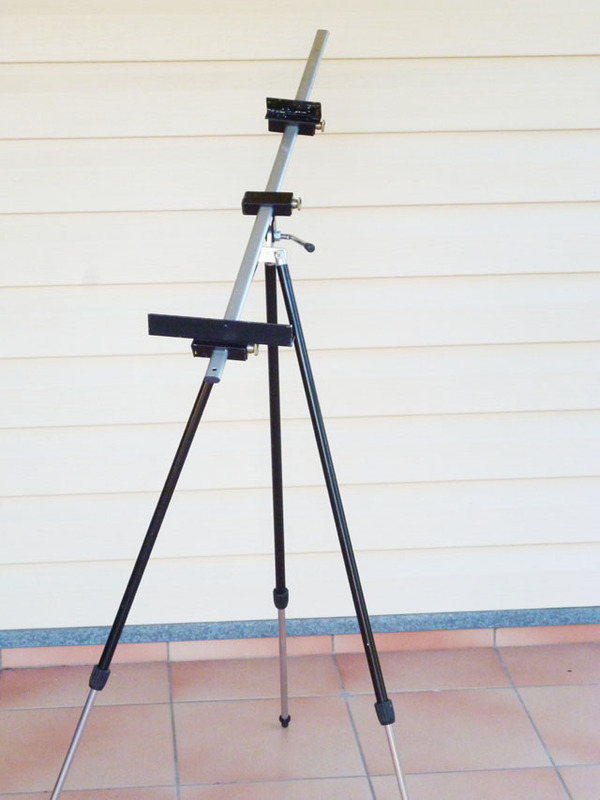 This tripod was purchased for photographic work and as such was a great workhorse. Fitted with a ball head with legs splayed in three positions it was an ideal tripod to adapt as an easel/. Weighing in at 2kg it is a little heavy but with add-ons very versatile. Initially I used Gatorboard in conjunction with a Ken Bromley Tripod Adaptor but updated this with a Sun Eden Travel Adaptor, which fits all photographic tripods. 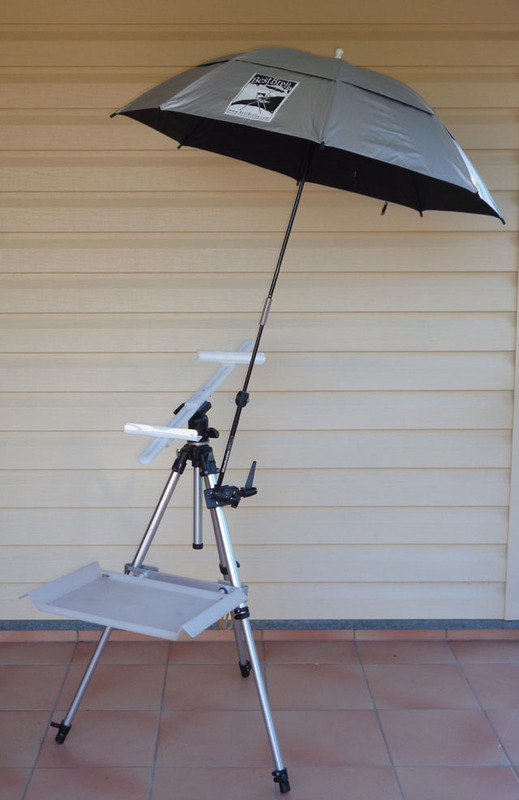 After trying several methods of making a shelf I decided on an Easel Butler and, in a sub-tropical climate (Australia), an umbrella is an essential. The Bestbrella claims to be the best there is and I concur. The Easel Butler - tray pulled forward - positioned in the lowest position - three positions available. 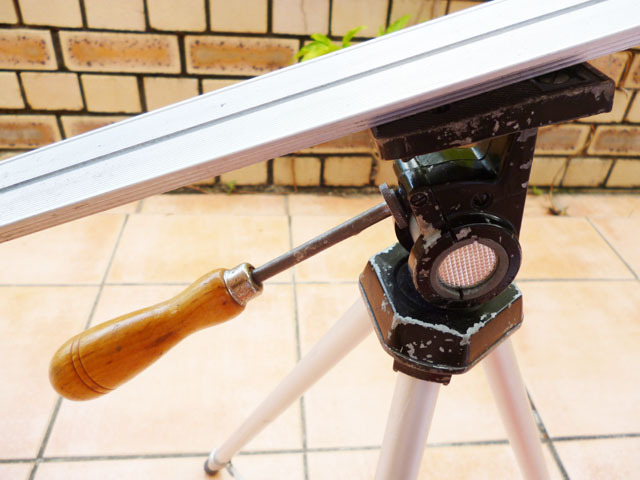 Hanging shelves and brollies off the tripod legs can make the ensemble front heavy - the oft quoted method is to hang a weight from the apex. A weight on the back leg is better as all the weight is situated on the front and unless a counter weight, I use a water bottle in the bag from Easel Butler which is purpose-made, is used the ensemble is inclined to lean forward. The splayed legs of the Manfrotto, which has three positions, help enormously in windy conditions,but once they are splayed the Easel Butler cannot be used. The new Manfrotto 190 is now a lightweight, carbon fibre, expensive tripod but the older aluminium model can be found for under 50 pounds on auction websites. Anyone considering purchasing a tripod to use as an easel should go for a ball head or a headless one that can have a ball head added. 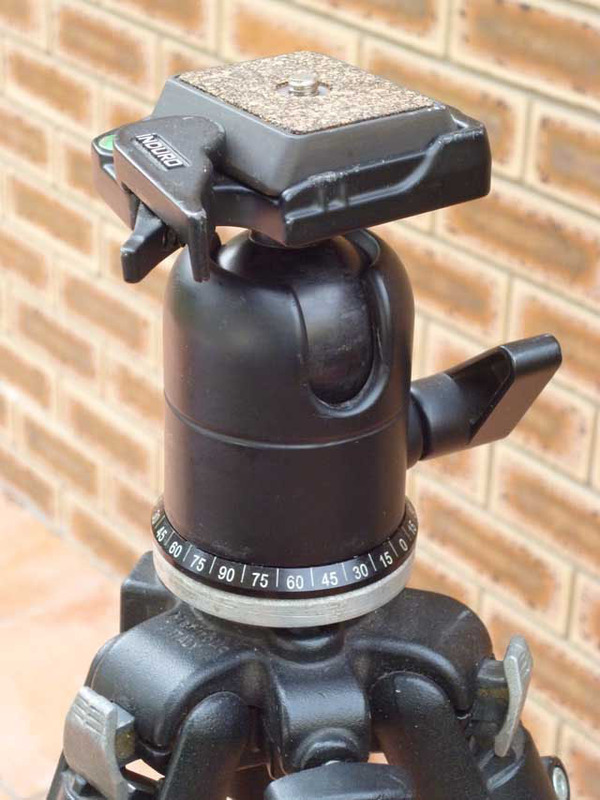 A ball head can move anywhere on the XY axis with ease, whereas a pan head is restricted. This setup is ideal most of the time but there are lighter, more compact, tripods that are almost as sturdy, and are ideal for travel, taking up very little room in a suitcase. 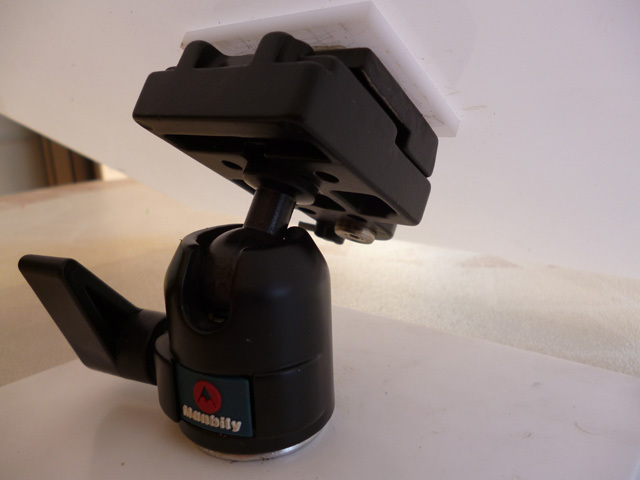 The cheaper method of attaching a support to any tripod is via a Bromley tripod adaptor plate. This needs to be screwed onto your support - Gatorboard - is possibly the superior board but, not readily available in the UK. First however a wooden plate must be glued to the board. The pictured plate is ready to accept the tripods quick release plate. I used 6mm MDF (PGW). Some web sites may suggest a small T nut with a quarter inch thread will suffice. 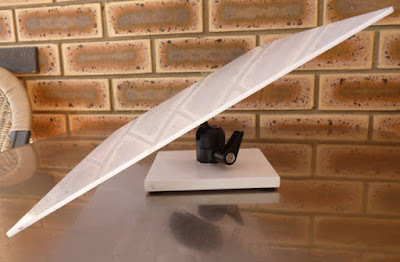 This method has neither the surface area or strength to hold a half sheet board and should be avoided. For those who don't want to spend 50 + pounds on a Sun Eden travel adaptor see above, however this tripod an do everything that the Manfrotto does. 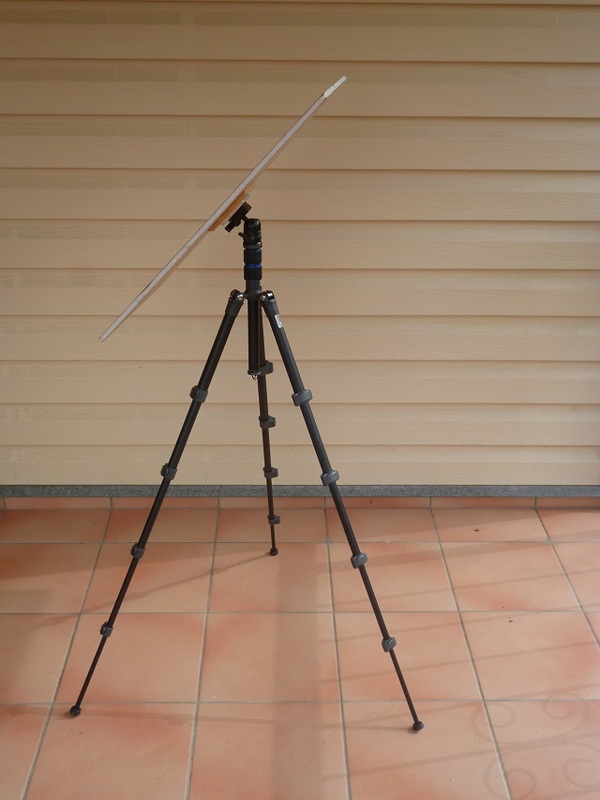 It is lighter (1.2kg) and will take the Sun Eden Travel Adaptor, Easel Butler and Best Brella. 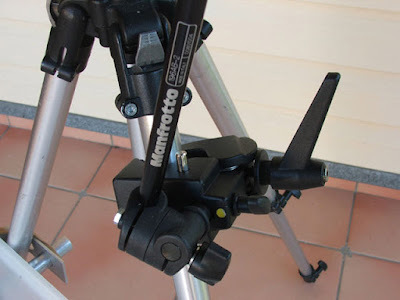 Not as sturdy as the Manfrotto with only one low position for splaying the legs, and is restricted to light weight supports of half a sheet or less. 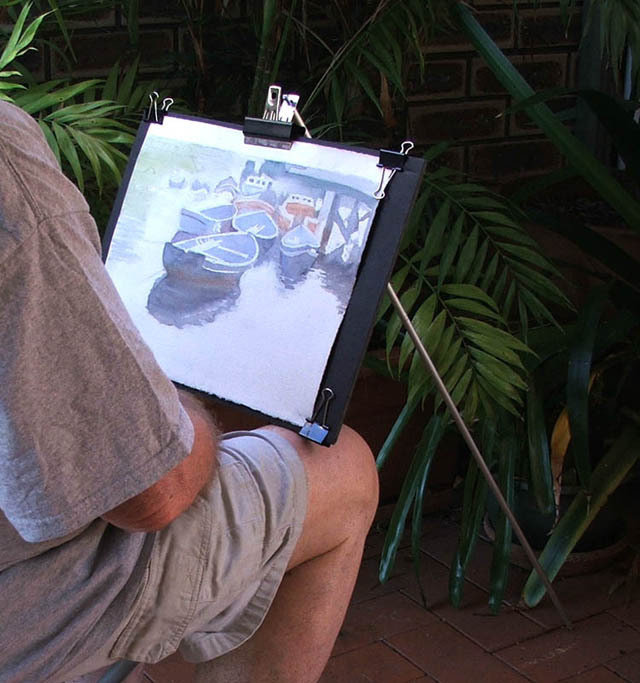 The big plus with this easel is its compact size when closed. 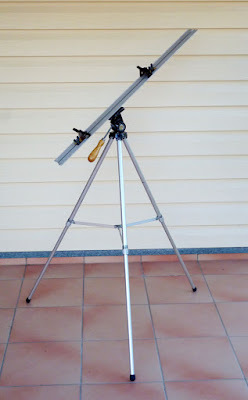 Together with the dismantled Travel Adaptor and the Easel Butler length is only 35 cm, yet when erected iis a full size easel. The brolly is better attached to the back leg for stability and is less wind resistant than larger tripods, but does everything you expect despite being so compact. I close this first installment with a novel, but nevertheless practical, do-it -yourself easel from the pages of Jack Merriots excellent book "Discovering Watercolour". This completes my photographic easel holdings and all my remaining ones are purpose-built but with the same criteria - strong, sturdy and versatile - more in Part Two. 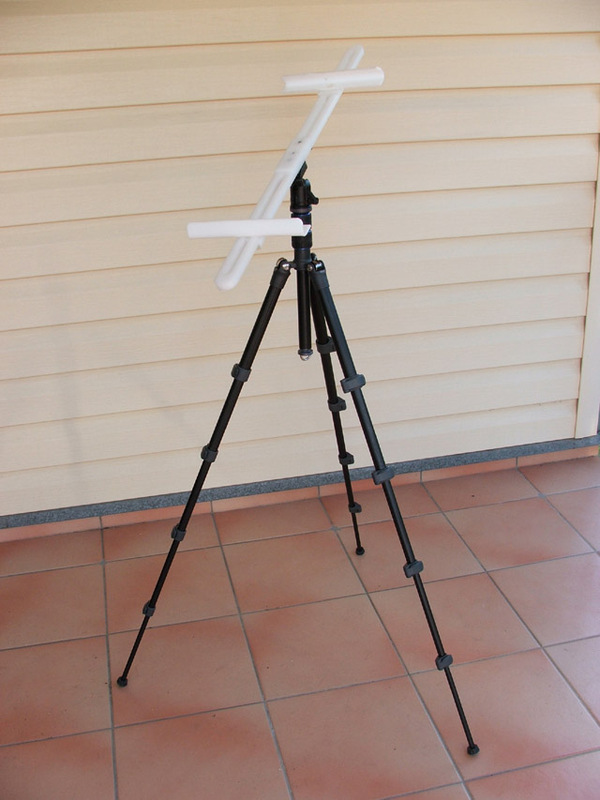 Nest Travel Tripod:-http://www.protog.com.au/buy/nest-pioneer-compact-travel-dslr-camera-tripod-235/NT235KBK Website: nest-style.com/tripod-kits. Just try `googling Nest'. This completes Pt One. When Pts 2 & 3 have been published John will answer any questions put to him.